Fr. 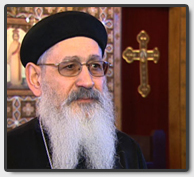 Shenouda has been serving as priest of St. Mary’s Church in Ottawa, since December 1992. His reverance was ordained priest on July 1st, 1973, and served at St. Shenouda’s Church in Quabbari, Alexandria, Egypt. His Holiness, the late Pope Shenouda III delegated Fr. Shenouda to serve in the Diaspora, first in London, England (1977-1979); then in Frankfurt, Germany (1980-1987). Fr. Shenouda is renowned for his service with the Youth, and Church Hymnology (Alhan and Tasbeha), besides his spiritual and in-depth Biblical studies. Fr. Marcos was ordained by H.H. Pope Tawadros II as priest of St. Mary’s Church in Ottawa, on September 28, 2014, during the historic visit of His Holiness to Ottawa. His reverance completed his spiritual revival in the monastery, and was welcomed to start service on November 14, 2014. The Coptic Community in Ottawa has been blessed with the service of many faithful shepherds. The beloved Hegomen (Archpriest), the late, Father Mankarious Awadalla served faithfully as the first Archpriest of our beloved Church. The church is deeply indebted to the loving service of Father Mankarious and his family. Our beloved Father Tadros Yacoub Malaty has served our Church and continues to bless us with visits from time to time. The beloved Father Bisenty Abdel-Messih Gerges has served our Church and now serves the blessed community of Saint George’s Coptic Church in Vancouver. The beloved Father Barsoom Kamel served in our Church from December 2008 to January 2014 and is now serving in Cairo. We are blessed with the service of our resident priests, Father Shenouda Boutros and Father Marcos Morcos. In the Ottawa area, we are also blessed with the service of Father Mikhail Fam, Father George Mikhail, and Father Anthony Mourad at the Church of Saint George and Saint Anthony; and we are blessed with the service of Father Joseph Dawoud at the Church of Saint Mark and Saint Mary of Egypt. May the Lord bless His flock, through the intercession of the Mother of God Saint Mary and the choir of Angels and Saints, and through the prayers and blessed service of His Holiness Pope Tawadros II and the blessed fathers.